By Anusha Ashwin Picture this! On a lazy Sunday morning, when you are reluctant to get out of that cozy bed, your hot cuppa coffee is already brewed; your air conditioner automatically turns off and your geyser turns on with the appropriate temperature for a nice hot bath!!! And you could do all this just by moving your finger over a smartphone application that automatically follows your preset command in switching on/off all the desired appliances in your house? Noida-based startup Oakter Private Limited is one such enabler that has conceptualized and created an IoT-based smart home kit, which can manage all household appliances’ operation through a centrally controlled hub and a smartphone application. With no additional alteration in the house, Oakter’s smart plug-and-play smart home products just adapts itself to most electrical fittings turning your simple abode into a smart home. The company’s products smarten existing home appliances that can be controlled better and that can be managed remotely just by using a mobile app. Oakter is on a mission to use technology to elevate life by better home management. Founders Shishir K Gupta, Nithin K David and Varun Gupta are the smart brains behind Oakter. “In the US, IoT products like Google Nest, Belkin Wemo, Samsung SmartThings and Amazon Echo have been very successful with penetration in more than a million homes. Oakter was founded to solve the same problem for Indian homes and lifestyles,” says Founder Shishir Gupta while introducing Oakter. Gupta, an IIT-Delhi alumnus, and his other friends from IIT, Nithin David and Varun Gupta were successful entrepreneurs in the engineering services sector. In 2014, they came together with the idea of starting something impactful to elevate Indian lifestyle. They first developed the design of a ‘Solar Air Conditioner’. However, that was not a commercially feasible product, as they realized that 1.5-Tonne AC costed Rs 2 Lacs. But, while developing the air conditioner, they discovered and developed an IoT-based controller to reduce energy consumption of the AC at night time operation. They deduced that the controller was able to substantially reduce energy consumption by about 30%. So they took that controller and expanded on the idea of IoT-based controller for home appliances. As they went deeper in to it, they were completely convinced that there was a workable IoT-based smart home product in the offing. 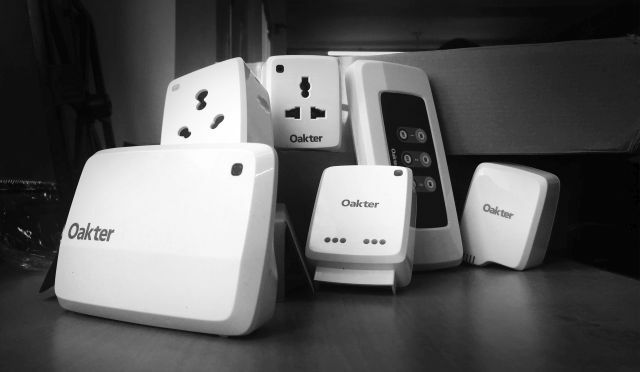 Oakter’s device can be used to smarten 34 different type of home appliances which include AC, water heater, water motor, mosquito repellant, fish tank, lamps among others. Oakter’s first product was launched in November 2015. The founders took pre-orders through a limited social media campaign and their first production batch was sold within two weeks. Currently, the company’s sales and marketing is focused on the National Capital Region (NCR) of India and Gupta says that in a short span, the social media had helped the company’s products reach hundreds of homes in NCR. The reviews so far clearly indicate that Oakter’s products score over some of the other home automation devices. 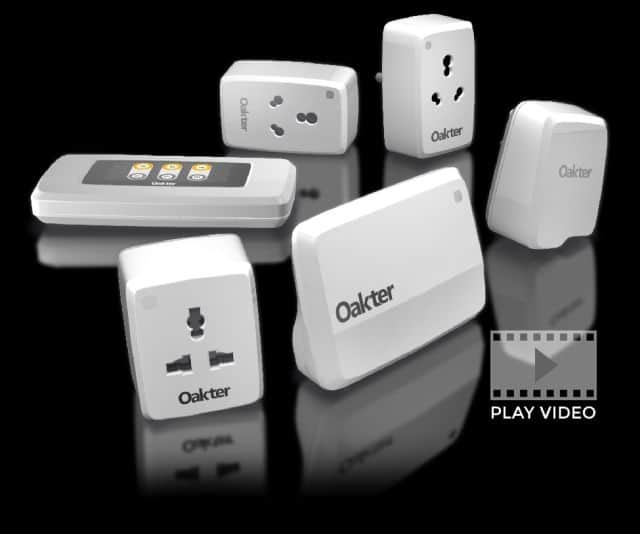 The simple installation of the plug and play product that fits like a glove in existing plug points, converting home appliances into smart home appliances is Oakter’s USP. “Oakter products follow LEGO like modular approaches for smart homes. We are offering consumers to start experiencing the advantages with few home appliances and then build up on it as per their need, one step at a time. Belkin Wemo has been a very successful company in US. Our products are very similar to Belkin Wemo and offer the same value proposition. Nest has been another very successful company in the US. Oakter’s smart-thermostat is a specifically designed Nest-like product for India. We are a completely Made-in-India company as against most of our competitors who import their products from China,” says Gupta. After demonstrating a successful product with raving reviews, investors who were approached by Gupta and team could not obviously deny funds. Oakter raised funds from Sachin Bansal, Binny Bansal, India-Quotient, Spice Group, Rajul Garg and few other popular angel investors. The company earns its revenue by selling the devices. Oakter has partnered with e-commerce giants Amazon and Flipkart for online sales. However, Gupta admits that most sales are through the company’s own website. “Make your Kit option on our website is very popular amongst users and they can love the idea of customizing their smart home kits as per their needs. To improve sales, we have boosted our social media and digital marketing. We are also in the process of building a retail and dealer network. We are also happy that we get lot of repeat sales and referral sales,” comments Gupta. With an active focus on India, Gupta intends to establish a strong presence at home first and then move to overseas market in the coming years. As an early mover in the home automation space in India, Gupta and his team have been tasked with an additional responsibility of creating awareness about the technology and its advantages in other metros and cities in India. “One of our ads on Facebook has been doing a good job on this task,” says Gupta. Alongside, steady product development, Oakter will roll out mobile apps and server side upgrades, once each quarter. The company will also roll out firmware upgrades once-a-year. Bullish about their product, Oakter’s founders are confident of launching one new product each year. “We are completely convinced that in the next five to 10 years we will see similar efficiency improvements in home management as seen in work management after the advent of PC, software and internet. Our target is to clock Rs 100 crore in sales between 2018 and 19,” says Shishir Gupta. · 6Amp Leaf: This is a smart plug for low powered switchboards that connect lamps, TVs, chargers, mosquito repellants, etc. · 16Amp Leaf: a smart plug for high powered switch boards that connect AC, geyser, room heater, water pump etc. · 16Amp Leaf linked with Comfort Leaf: The 16 Amp leaf or smart plug will turn on and turn off heating/cooling devices from the user’s smart phone and also schedule them. · Touch Leaf: There are 3 physical buttons on the touch leaf, these can be configured using the Oakter mobile app. Touch Leaf works offline with no internet connection. · Hub: This is the main organ of the smart home kit to which the internet is connected. The hub is capable of connecting upto 50 devices. It is a small box that provides internet connectivity to all the leaves. A handout provided with the kit explains in detail on the product’s step-wise installation. The installation is simple, convenient and easy. It is compatible with most devices at home irrespective of their brands and is also adaptable to wall sockets in old constructions as well as the new-age constructions. The first step to installation is to attach the appropriate Leaf or smart plug to the wall socket and plug the desired low power appliance or high power appliance to be automated. The next step is to connect the hub to an internet connection. The third step is to download the Oakter App and key-in the password provided by Oakter. Once the initial setup is complete and when Oakter’s server recognizes the device, the automation kit is all set to operate at home. The app allows the user to set schedules for individual leaves, giving the user the advantage of switching the device on/off at a preset time. Also, the app lists an activity log for each leaf. In case of power failure, the leaves auto-cutoff evading damage to the controls within the leaf. The product is adaptable to any wall socket in the house and is easy to install. The product works for both new construction and old construction. In fact, I would say it is better suited for older buildings. The kit can be customized according to the desired appliances or switches that need automation. All operations from hereon are in a single app. In case of physically challenged, for sick and old people this product can be a boon. Either, the person can automate or control the temperature in the room by oneself or the caretaker could do it from a remote location. Ditto for working parents who would like to impose restricted TV viewing for their children. And for someone like me who forgets to switch off essential high electricity consuming appliances like geysers, now, at least I have Oakter to save on electricity. Since the product is new in the market the after-sales service and upgradations are to be looked out for. Also, to suit the modern households, I would have preferred different colored Leaves. Oakter can consider bringing in colour choices. The kits are available on Amazon, Flipkart and Oakter’s website. And Oakter provides a one-year warranty for manufacturing defects from the date of purchase. Smart Home Kit – Rs 10,000: This includes the hub, 6Amp Leaf, 16Amp Leaf, Smart Thermostat or Comfort Leaf and the Touch Leaf. Customized Home Kit – Rs 2,800 onwards: One can choose the leaves according to the requirement. Oakter plug-play smart devices drive India’s home automation market 0 out of 5 based on 0 ratings. 0 user reviews.